Imagine the feeling of looking at the man who murdered your uncle, who cut out his organs and gave it to someone to eat- and forgiving him. Imagine being abused and taunted, and when given the chance to retaliate, instead you forgive. This was the Messenger of Allah Ta’ala (sal Allahu alayhi wa sallam), a man described as “an excellent exemplar for those who hope in Allah and the Last Day” [Quran, Chapter 33, Surat al-Ahzab, 33:21]. Many of us cannot forgive our parents or friends or spouses when they say hurtful things in anger. We hold grudges for years, unable to forget the things people have done to us. On the one hand, we feel justified in feeling this way. After all, we are the ones wronged. On the other, bottling things up inside is unhealthy at the very least, on both a spiritual and psychological level. It is natural to be upset at someone when they’ve hurt you. The Prophet (sal Allahu alayhi wa sallam) told us that a Muslim is not allowed to break off ties with another Muslim for more than 3 days, recognizing that we need time to cool off. Yet what is unhealthy, and often destructive, is the inability to forgive and move on. 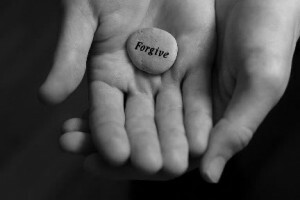 So what does forgiving actually mean? Forgiving means not carrying a grudge in your heart against that person. Forgiving means that if you were given the chance to retaliate, you would choose not to. Forgiving means not wishing evil, even if secretly, upon the person. It means you can continue to be civil towards them, and that you can even bring yourself to pray for their well-being and guidance. However, forgiveness does not mean that you cannot learn from the trial. It doesn’t mean that the person did not do wrong, nor does it justify what they did. If you trusted someone and they betrayed your trust, forgiveness does not mean that you have to trust them again if they haven’t given you reason to. You are able to treat them well, without resentment in your heart, but if you learned something about their character, you should keep that in mind when dealing with them. So how can we benefit from forgiving others? How can this help us to be productive Muslims? There is a direct correlation between the ways we treat others and how Allah (Subhanahu wa Ta’ala) treats us. We all know the Prophet’s (sal Allahu alayhi wa sallam) famous saying “Have mercy on those on the earth, and the One in heaven will have mercy on you” [Tirmidhi]. Of course, Allah (Subhanahu wa Ta’ala) is incomparably greater and more merciful than us. Therefore, whatever we do for others, Allah will multiply that for us. If we are sincere in wanting Allah (Subhanahu wa Ta’ala) to forgive us for our many slip-ups and sins, we should be prepared to do that for others. That is what it means to be true believer. Our focus is not simply in how much we pray, although that has its place. Rather we are so focused on gaining the pleasure of Allah that people’s wrongs against us are insignificant. This is why Allah described the believers as “those who avoid the major sins and immoralities, and when they are angry, they forgive” [Surat ash-Shu’ara, 42:37]. Psychologists have said that the inability to forgive may cause a person to repeatedly bring anger and bitterness into every relationship and new experience. The hurt and insecurity caused by our offender is projected onto others, because we were not able to move on from our previous experience. We are not being asked to condone what others have done to us, but rather we should acknowledge that they have hurt us and it was wrong. We should reflect on why this was hurtful, what may have been the motives of the person who hurt us, and what we should learn. And then we should move on, because we cannot change the past, but we can certainly use it to empower ourselves and become better people, insha Allah. When we take the step to learn from a hurtful experience, we should be able to prevent ourselves from doing the same to others. Many times we condemn what we do ourselves- we are hurt that someone has spoken behind our backs, but we backbite all the time. We feel slighted when we are not appreciated by our parents, but never once did we recognize and thank others for the things they do for us. This introspection should help us to gain greater clarity into our own dealings with people. Another psychological effect of forgiving others is that it teaches us sympathy. When we let go of anger, we can better understand those who are put in the same situation that we were in previously. Sometimes it helps us to not demonize the person who hurt us; the specific thing that they did may have been bad, but when we step back, we sometimes learn that they have their own baggage that caused them to act in a certain way. This is not to condone what they did, but it is to enable us to see that the world is not always so black and white. The inability to forgive affects us spiritually and psychologically, and furthermore, has a detrimental effect on our health. One study showed that people who focused on a personal grudge had increased blood pressure and heart rates, as well as increased muscle tension and feelings of being less in control. Participants in this study were asked to imagine forgiving their wrongdoers, and they said they felt more positive and relaxed and thus, the changes disappeared. May Allah give us the strength to forgive others for their faults, and to forgive us for our own. Ameen.